Freeflow69 are one of the key market leaders in the design, manufacture and installation of Micro Hydro Power for private, commercial and the small industrial sector. With over 10 years experience, we specialise in producing water wheels and Archimedes Screws, using our extensive knowledge and expertise of the traditional Overshot, Breastshot, Poncelet and Zuppinger water wheels. Our Stainless Steel water wheels are manufactured here in the UK by our associate company, Able Engineering, who are based in the Midlands. From initial consultation, through design, planning, manufacture, installation and commissioning, the Freeflow team will guide you through the process of realising the potential of your own Micro Hydro Renewable Energy project. 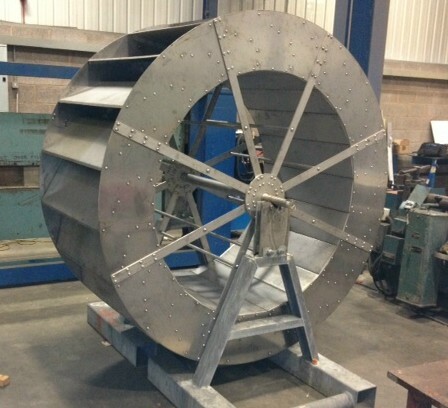 We can offer a standard size overshot type water wheel to be supplied in its component parts or assembled. 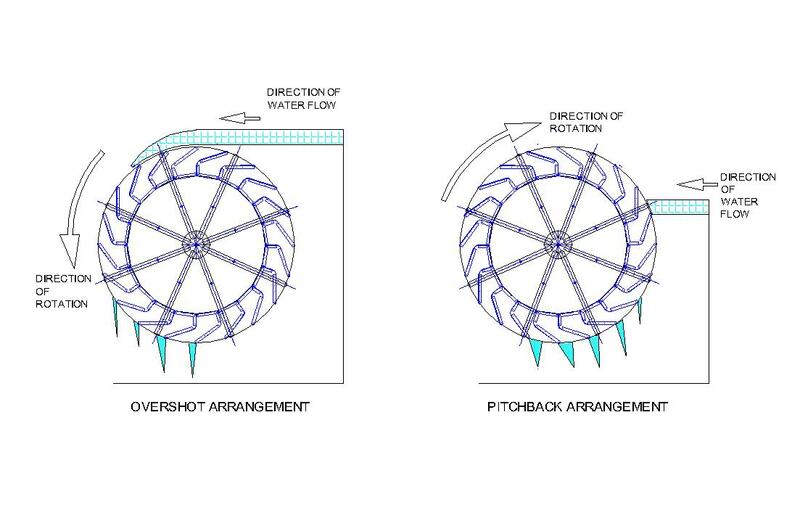 The wheel can be used as a typical overshot wheel if the upstream water level (head) exceeds the diameter of the wheel, with lower head levels it can be used as a pitch back wheel, the head range is 2.5m down to 1.5m. The wheel can be supplied in kit form for the customer to assemble, possibly on site, or fully assembled. The gearbox, generator and control system will be specified but can be sourced by the customer. This is a fish friendly application for generating electricity. The size of the standard wheel is 2m diameter x 0.9m width, optimum flow is around 0.2m3/s. This gives a power range between 3kW and 1.7kW depending on the water head and flow that is available at the instalation. The wheel blades and shroud plates are manufactured from grade 1.4003 stainless steel to give many years of service without worrying about corrosion. Price for the assembled wheel with shaft (see photo above) is £5500.00GBP +VAT (ex-works).